Alaska is the northernmost, westernmost and the largest state in the United States. 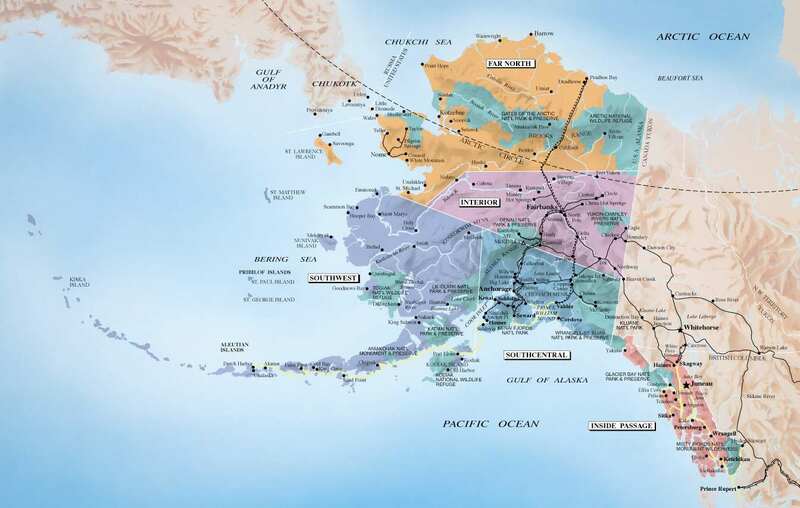 JUNEAU, the capital, is situated on the mainland of the North American continent but is not connected by road to the rest of the North American highway system. This immense and sparsely populated state is bordered by Yukon and British Columbia in Canada, to the east, the Gulf of Alaska and the Pacific Ocean to the south and southwest, the Bering Sea, Bering Strait, and Chukchi Sea to the west and the Arctic Ocean to the north. The United States purchased Alaska from the Russian Empire on March 30, 1867, for 7.2 million U.S. dollars. In 1959 Alaska became the 49th state of the USA. Alaska’s economy is dominated by the fishing, natural gas, and oil industries, resources which it has in abundance. Military bases and tourism are also a significant part of the economy. Alaska’s indigenous people are divided into eleven distinct cultures with 20 different languages. ALASKAN NATIVES make up about 16% of the state’s total population and they live in cities, towns and villages separated by vast distance and unique geographical regions. Alaska is stupendous in everything you can see there: nature, people, traditions, wild-life, flora, fauna, ethnography and history. Its vast expanse of land consists of A PLACE OF AMAZING LANDSCAPES! In SUMMER, it is possible to take a cruise to see the glaciers, waterfalls and wildlife; cycling in many places, strolling through the mountains; to fish; walk the trails of one of the many parks, see the whales; to admire the bears catching salmon; dog sledding on the glaciers; see the midnight sun; visit the national parks… In winter, it is possible to see the Northern Lights; dog sledding; skiing… If you prefer to visit Alaska in WINTER season, go in late February and March that offer more daylight and less extreme temperatures. If you want more information, contact us. IF YOU REALLY WANT TO GET TO KNOW ALASKA VERY WELL, IF YOU WANT TO ENJOY EVERYTHING THAT THIS WONDERFUL REGION CAN OFFER, TRAVEL BY TRAIN, PLANE, BUS, BOAT, SEAPLANE, CAR, HELICOPTER AND… ON FOOT! Anchorage was originally settled in 1915 at the mouth of Ship Creek to support railroad construction. Anchorage has grown steadily to become the business, cultural and distribution center of Alaska. Nowadays nearly half of Alaska’s 600,000 residents live in Anchorage that is the biggest city of Alaska. It has the biggest hydroplane airport of the world! This night we walked to CAPTAIN COOK HOTEL (939 W. 5th Avenue) for drinks and food at Fletcher’s, an English Pub. It is a perfect place to have a meal and great drinks, with a wide range of Scottish beers, breweries, home brewed and imported, all in a very beautiful room. DELICIOUS! Brown bears are famous for their salmon-fishing antics, their size and their ferocity. They are found in many parts of North America and Eurasia, where the bears inhabit wooded and mountainous areas. Brown bears tend to feed on vegetation, fish and small land mammals, but the bears will only occasionally hunt bigger mammals like deer. Brown bears don’t seem to be a great threat towards humans, although the mother brown bears will protect their young bear cubs. Brown bears generally grow to about 2-3m tall, looking enormous when the bear stands on its hind legs. It was established in 1980 in order to protect scenic beauty: volcanoes, glaciers, wild rivers and waterfalls, populations of fish and wildlife, watersheds essential for red salmon, and the traditional lifestyle of local residents. Sightseeing for Alaskan brown bears, grizzly and black bears are its specialty. There are also opportunities to view other large and small game like caribou, moose, sheep and numerous varieties of birds. ALASKA’S LAKE CLARK INN is located on Lake Clark. Nearby Lake Iliamna is Alaska’s largest lake and spawning grounds for one of the largest runs of Red salmon in the world. If you want more information, contact us. DAY 2 – The next day, very early in the morning, we took a taxi to the ALASKA AIR TAXI to start the “BEAR VIEWING TOUR”. We also did, in a hydroplane, a scenic flight along COOK INLET into LAKE CLARK NATIONAL PARK. Known as the “Alaskan Alps”, this is the place where the Alaska and Aleutian Ranges meet. FANTASTIC FLIGHT! Upon landing on the banks of LAKE CLARK, a guide met us and took us to see these immense and incredible brown bears in their natural habitat. We saw these huge bears fishing salmon, swimming playfully with each other and frolicking with their bear cubs. IT WAS AN UNBELIEVABLE EXPERIENCE! At lunch time, we went to the ALASKA’S LAKE CLARK INN, a lodge located just nearby, to have our meal in a marvelous setting. After lunch the guide took as to get to know the places around. After that, we returned to the lodge to have some cake and a hot drink. When we were leaving, we had a WONDERFUL SURPRISE: three bear cubs were playing near the hydroplane! We had to wait for them to leave to return to Anchorage. If you want more information, contact us. BE AWARE – WHAT TO WEAR – due to unpredictable Alaskan weather, you must dress in layers, which will allow you to stay warm and dry as the outdoor environment changes. Wear comfortable hiking boots and a jacket that can shield you from light wind or rain. Don’t forget your binoculars, insect repellent, bottle of water, sun block, sun glasses and a small pack enough to carry your equipment. BE AWARE – BASIC BEARS SAFETY TIPS – BE VISIBLE, MAKE NOISE: Bears don’t like to be surprised. A surprise encounter with a bear is dangerous. Avoid surprises by traveling in open areas with good visibility. Make noise as you walk, particularly in if visibility is poor – talk, clap or even sing. Be extra alert in windy conditions or near noisy streams that mask your sound. SAFETY IN NUMBERS: The larger your group is, the less risk of a bear attacking. Group members should stay within a few feet of each other, particularly if visibility is poor. Scattered groups do not provide the protection of cohesive groups. AVOID BEARS: If possible, change your course to avoid bears that you’ve detected, or move slowly away from them. Never approach a bear, even from a boat or kayak; approaching a bear can cause undue stress and provoke an attack. STORE FOOD APPROPRIATELY: Keep all food under your control at all times. Do not allow a bear to get your food. It will only encourage the bear and make the problem worse for the next person. DAY 3 – The next day, we visited the ALASKA NATIVE HERITAGE CENTER (8800 Heritage Center Dr.) that is a cultural center and a museum where visitors can expand their understanding of Alaska’s Indigenous people. It shares the rich heritage of Alaska’s 11 major cultural groups. Visitors experience Alaskan native culture through the authentic native song and dance, art exhibits, native games and presentations. We strolled through six authentic life-sized native dwellings situated in a wooded area around beautiful Lake Tiulana and were introduced to the traditional life ways of those peoples. Each village site has a traditional structure along with artifacts that each group used in their daily lives. We visited the culture representatives in each village site. If you want more information, contact us. In the afternoon we did a walking tour around the “Historic Downtown”. We started at the W 2nd Ave to visit AEC COTTAGES and LEOPOLD DAVID HOUSE that are two simple cottages, used by the engineers and railroad workers that offer a window into life in Anchorage during the 1920s and ’30s. Then, we walked to the FEDERAL BUILDING (W 4th Ave) that is the Anchorage’s first concrete building, erected in 1939 by the U.S. government. Indeed, when World War II broke out shortly thereafter, the federal government added military bases and infrastructure to the Alaskan territory. Nearby, is the ART-DECO THEATRE that was opened in 1947 by a 20th-century media tycoon who wanted to establish Alaska as Northern Hollywood. On the same street is the LOG CABIN AND DOWNTOWN INFORMATION CENTER located in a very interesting wooden house. The 4th Avenue used to be the only place where the men working in the coal, oil and lumber industries around Alaska spent their money, in the 1940s and 50s. The string of drinking establishments became known as the world’s longest bar. We walked by the OLD ANCHORAGE CITY HALL (524 W 4th Ave), which was – when it was built in 1936, Anchorage’s biggest building, encompassing every major municipal function, to reach the HISTORIC ANCHORAGE HOTEL (330 E St) that stands out for being charmingly old. We walked to the WENDLER BUILDING (400 D St), also known as Club 25, which was a popular café and bar in the 1940s and ’50s, but it was for women only. We passed by the DELANEY PARK on the way to OSCAR GILL HOUSE (1344, W 10th Ave). This house belonged to Oscar Gill, who was a local statesman, but his house achieved fame all on its own. Gill was Anchorage’s mayor during Prohibition, when bootlegging was big business. Gill denied any involvement himself, but his house clearly acted as someone’s portal for smuggling booze. Window sills could be jerry rigged to send bottles up through the walls and between the studs. Today you can still see pieces of broken bottles inside the walls. We passed NULBAY PARK (W 7th Ave) and ELDERBERRY PARK (W 5th Ave) to reach the OSCAR ANDERSON HOUSE MUSEUM (45th Avenue and M Street). This museum offers visitors the opportunity to experience life in early Anchorage more than 30 years ago. From there, we continued to RESOLUTION PARK (320 L St), where we could see the bronze monument of Captain Cook and a beautiful view of Knik Arm and the mountains. If you want more information, contact us. We had dinner at ORSO RESTAURANT (737, W. 5th Street), which is a perfect place to have good food and excellent service. DAY 4 – The following day, we took a bus to WHITTIER to do the “PRINCE WILLIAM SOUND – 26 GLACIER CRUISE”. This one-and-half-hour trip was VERY BEAUTIFUL! When we arrived in WHITTIER, we boarded the catamaran M/V Klondike Express that is a vessel for 338 passengers and crew. The vessel has three decks, two of which are enclosed and heated and the third deck with a large outdoor viewing area. And, there we began our four-and-a-half-hour adventure through the passageways and fjords at Prince William Sound. If you want more information, contact us. The vessel headed out for the Passage Canal toward Perry Island in search of migratory sea lions. Then it proceeded to the SCENIC AREA of Esther Pass where only small ships can sail. High mountains protect this narrow channel of seas and hectic winds. Many different animals live in this area. Orcas, humpback whales, sea lions, harbor seals, sea otters, a wide variety of birds and even black bears can be seen in this region. Esther Passage opens into College Fjord, where the ship headed north for a panoramic view of all the glaciers named after the Eastern Colleges during the Harriman Expedition. Next, we sailed to Surprise Glacier and Barry Arm, located in the Harriman Fjord. On the way we passed through ice-filled waters up to the front of the glacier, where we saw massive chunks of ice calving into the sea. On the return trip, we stopped at a kittiwake bird rookery that is located just across the bay from Whittier. Over 10,000 birds inhabit these rocky cliffs each summer laying eggs. IT WAS A WONDERFUL CRUISE! We returned to Anchorage by train. If you want more information, contact us. Whittier is located at the base of mountains that line Passage Canal, one of the deep-water fjords of Prince William Sound. The surrounding peaks are snowcapped much of the year and a glacier hangs above the town to the west. Whittier was created by the U.S. Army during World War II as its “secret port”. We had dinner at THE MARX BROTHERS CAFÉ (627 W, 3rd Ave.) that is considered as the best restaurant in Alaska. EXCELLENT! DAY 5 – The next day we went to ANCHORAGE DEPOT to get on the GOLDSTAR DOME TRAIN (Alaska Railroad Anchorage) to go to DENALI NATIONAL PARK. The train departed at 8:15am and we arrived at the Park at 3:40pm. The GoldStar Dome is the top-of-the-line rail service with glass- dome ceiling and upper-level outdoor viewing platform. During this trip, we had spectacular views, including the McKinley Mountain, from the large windows. Many time, the train slowed down to allow passengers to take pictures. If you want more information, contact us. THIS TRIP WAS THE BEST TRAIN RIDE WE HAVE EVER BEEN ON. When we arrived, there was a bus waiting to transfer the passengers to the hotel where we stayed. This hotel is located only 1.5 kilometers from the DENALI NATIONAL PARK entrance, on the banks of the NENANA RIVER. The main lodge and the outdoor deck provide great views of the Park and the Nenana River Canyon. THIS IS A FABOULOUS HOTEL! If you want more information, contact us. Congress created this park in 1917; at the time, the purpose was to protect Dall sheep from over-hunting. The park’s size and purpose grew over time. The park is now around 25 hundred square kilometers, and much of the park must remain devoid of human development. This means that the only trails in the park are near the park road, and mainly near the park’s entrance. Denali Park is home to North America’s highest mountain, MOUNT DENALI (before Mount McKinley), towering over 6,200 meters tall. The National Park gives one of the best opportunities to see Alaska’s wildlife such as grizzly bears, moose, wolves, Dall sheep and caribou. The name “Denali” means “The Great One” in the native Athabascan language. DAY 6 – The next day at 6:45 a.m. a bus picked us up at our lodge we were to go to KANTISHNA WILDERNESS TRAILS DRIVE / FLY EXCURSION. On this tour, we crossed Denali Park for over 150 km, passing by forests and high alpine tundra on the way to KANTISHNA ROADHOUSE, which is located just after Wonder Lake on the shores of Moose Creek. On the way, we found three bear cubs walking on the road. IT WAS AMAZING! If you want more information, contact us. When we got to the KANTISHNA ROADHOUSE, we had lunch. After that, an experienced woman helped us with our gold mining efforts and we found 3 tiny chips of placer gold! At 3:00p.m., we took a scenic flight back to the hotel. As the place of departure is much closer to the mountain, in a one hour flight, we spent 40 minutes circling the mountain. The flight took us to the north face of Denali and then traverses the expansive Muldrow Glacier, following the spine of the magnificent Alaska Range to Denali Park’s bus depot. So we could see the park in a different way. IT WAS A FANTASTIC EXPERIENCE! If you want more information, contact us. BE AWARE – WHAT TO WEAR – Dress in layers that will keep you warm and dry. Wear comfortable walking shoes, scarf and a jacket that can shield you from light wind or rain. We recommend you also bring bug spray, sunglasses and binoculars if you have them. DAY 7 – The following day, at 7:30a.m., we returned to Anchorage in a six-hour trip by bus, since we preferred to know two different ways of travel. The Parks Highway north of Anchorage travels the fertile Matanuska-Susitna valley, up through Denali State Park which offers some of the best views of Mount Denali. On the way, we stopped at the TALKEETNA ALASKAN LODGE that has a stunning lobby, with a three-story river rock fireplace, and an expansive decking from where we had a spectacular panoramic view of Mount Denali and the Alaska Range. When we arrived in Anchorage, we took a taxi to the airport to fly to JUNEAU, by Alaska Airlines. Juneau, Alaska’s state capital, was founded as a gold-mining camp in 1880. Downtown Juneau sits between Mount Juneau, Mount Roberts and Gastineau Channel, and is a maze of narrow streets running past a mix of new structures, old storefronts and quaint houses featuring early 19th century architecture left over from the town’s early gold mining days. With no road access to Juneau, it is the only state capital in the United States that can only be reached by airplane or boat. 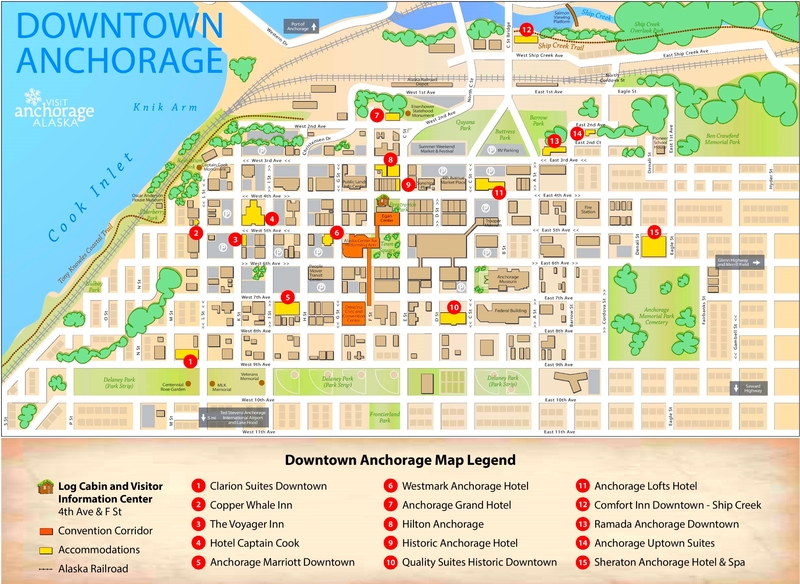 When we arrived in Juneau, we took a taxi to the hotel where we stayed that has a wonderful downtown location. This night, we had dinner at the hotel’s restaurant. If you want more information, contact us. DAY 8 – The next day, at 10:30am, a van picked us up to go to the heliport to do the DOG SLEDDING ON THE MENDENHALL GLACIER TOUR. There, we watched a video on security and we put on glacier boots. Then, we boarded the helicopter to fly to MENDENHALL GLACIER and the dog camp. We flew over lush rainforest, deep blue crevasses and peaks carved out of glaciers. IT WAS A SPECTACULAR FLIGHT! EXCITING FOR THE BEAUTY OF THE SCENERY! After we landed at the Mendenhall Glacier’s dog camp, we visited the 240 Alaskan Huskies. Then, we sat on a sled to be driven by professional mushers and twelve dogs. We also drove the sled! WHAT A FANTASTIC EXPERIENCE! Then we talked to the mushers, took lots of pictures with the dogs and boarded the helicopter for the panoramic return to the heliport. Afterwards, we returned to the center of Juneau. If you want more information, contact us. BE AWARE – WHAT TO WEAR – dress appropriately with layered clothing, hats and gloves. The sunlight can be very intense and reflects off the glacier, sunglasses are recommended. Temperatures can vary 10 to 15 degrees from sea level. Also bring rain jacket, scarf and comfortable shoes. We had lunch at HANGAR RESTAURANT (2 Marine Way, Wharf Mall) that serves a selection of fresh seafood, steaks, burgers and chowders and has a wonderful waterfront view. In the afternoon we went shopping on North Franklin Street and South Franklin Street. Then we went for a walk in the Juneau Harbor. DAY 9 – The next day, we went to the airport to fly to GUSTAVUS by Alaska Seaplanes, a 25-minute flight. Just leaving Juneau we had a good opportunity to photograph the MENDENDENDENHALL GLACIER. Gustavus is a picturesque community located 150 km west of Juneau. The native Tlingit people and others used the area for fishing and berry picking. The town itself is less than one hundred years old. Spread across a large plain created by receding glaciers, Gustavus is an oasis of civilization surrounded by Glacier Bay National Park. Sandy beaches offer an inspiring contrast to snow covered peaks of the FAIRWEATHER RANGE to the west and CHILKAT RANGE to the east. Today there are approximately 450 year-round residents who call Gustavus home. Glacier Bay National Park and Preserve was named a national monument in 1925. It is comprised of 13,350 square kilometers, in Southeastern Alaska, near the community of Gustavus, and provides an example of one of the most rapid glacial retreats documented. The area was covered in ice just over 200 years ago and now offers an intriguing natural laboratory for scientists and a stunning area for visitor exploration. Glacier Bay has a maritime climate, with relatively mild temperatures in the winter and cool summers. The park has snow-capped mountain ranges rising to over 15,000 feet, coastal beaches with protected coves, deep fjords, 16 tidewater glaciers, and coastal and estuarine waters. As marine waters make up nearly one-fifth of the park, Glacier Bay is rich with marine life, including the humpback whale. From the Gustavus Airport we took a taxi to GLACIER BAY LODGE, in Glacier Bay National Park. This is the only lodging inside the park and is surrounded by spectacular scenery. After the check in, we did the1.6-kilometer round walking “Forest Loop Trail”. This loop trail took us through both the temperate rainforest and the beach environments of Bartlett Cove. We began the walk in front of the Lodge. The trail surface varies between dirt, gravel and boardwalk. There were two benches and viewing platforms along the way where we sat to admire nature. If you want more information, contact us. At 0:30pm, we went to GUSTAVUS CITY DOCK to board the M/V TAZ, a 50’ long vessel, to follow the WHALE WATCHING & WILDLIFE VIEWING TOUR. The vessel has an open back deck to view and photograph whales and wildlife. We went to the POINT ADOLPHUS and ICY STRAIT areas that are a nutrient-rich feeding ground for several types of whales. We heard the underwater sounds of the whales through the hydro-phone system and saw 17 humpback whales dancing around the boat. CAN YOU IMAGINE HOW SPECTACULAR THIS WAS? BE AWARE – WHAT TO WEAR – Temperatures will be cooler on the water, near the glaciers. Weather here can change quickly. You should dress waterproof jacket, hat and pants, insulating layer of wool or fleece, long-sleeved shirt, polypropylene underwear tops and bottoms, warm sturdy footwear (ideally waterproof) and warm socks, warm hat to cover your ears, gloves, sunscreen, lip balm for wind protection, sunglasses. If you want more information, contact us. We returned to the Lodge for dinner and were able to watch one of THE MOST WONDERFUL SUNSETS WE HAVE EVER SEEN! DAY 10 – The next day, at 6:45am, we went to the dock at Glacier Bay Lodge on BARTLETT COVE to board the high speed catamaran, to follow the GLACIER BAY NATIONAL PARK CRUISE TOUR. If you want more information, contact us. We traveled through different ecosystems – moving from the rainforest that surrounds Glacier Bay Lodge to the lichen encrusted rocks that exist on the edges of the massive tidewater glaciers of the park. We arrived at the MARGERIE and GRAND PACIFIC GLACIERS, two towering masses of ice and snow rising 75 meters above the ocean and stretching another 30 meters beneath the water. The ice that calves from the face of the two glaciers is an average of 200 years old. On the way we saw a black bear. IT WAS FANTASTIC! We returned to the Lodge just to pick up our luggage and took a taxi to the airport. From there we flew to Juneau. When we arrived, we went to hotel to spend a night. DAY 11 – The day after, we flew to SEATTLE by Alaska Airlines. AFTER VISITING NEARLY A HUNDRED COUNTRIES ALL OVER THE WORLD, WE BELIEVE THAT ALASKA IS ONE OF THE MOST BEAUTIFUL PLACES TO VISIT. WHEN TO VISIT ALASKA – The best time to visit Alaska depends on what you want to do. Tourist activities are minimal during the months of October, November and April. These months are times of transition between seasons and visitors do not have the opportunity to see Alaska at its best. Visit Alaska anytime between mid-May to mid-September, when the days are long and nature is in full bloom. Peak season is mid-June to mid-August. Alaska’s summer temperatures are very pleasant, but weather is highly unpredictable. Daytime highs range from 15°C – 27°C and the nighttime lows into the 5°C – 10°C. However, temperatures vary depending on which region of Alaska you plan to visit. POWER – Across the US, the electrical current is 110 Volts. TIME – Most of Alaska is 9 hours behind Greenwich Mean Time – GMT-9. The western most Aleutian Islands and St. Lawrence Island are 10 hours behind – GMT-10.